The Checkers roster currently holds 14 forwards and eight defensemen along with a pair of goalies. good article. Vellucci isn’t pulling punches about Bean. Requiring a defenseman to be able to play defensively as well as offensively. I like. Bean is on the third pairing. Ned starting. the 2nd and 4th lines for Charlotte are the most intriguing to me. Maenalanen is on the first line. He is worth monitoring to see if he will get a call up. Roy is on fire! McKegg is continuing his PPG rate from last season and Ned got another start. Ned saved 34 of 36. Thanks for the updates and the prospect stuff gocanes. Love it. Part of what should be fun this year is all of the potential NHL talent percolating in the lower levels. Which guy will suddenly arrive on the scene? Right now sort of sounds like Roy. He's had a taste of the NHL and a full AHL season under his belt. This is a guy who has really thrived more like a first rounder after he was drafted. Further, he's a center, and we need centers. Kuokkanen is the guy I might have predicted would excel this year. Pretty good start with 4 points in 2 games. Also, I'm watching Gauthier this year. He really needs to step up his scoring this year. Ahead of another weekend on the road, the Checkers have assigned Nick Schilkey to the ECHL’s Florida Everblades. The 24-year-old forward was a healthy scratch for Charlotte’s first two games this season. Schilkey spent the entirety of his rookie campaign with the Checkers, logging 12 points (5g, 7a) in 48 games. Roy took center stage in the Checkers’ two season-opening victories against Rochester, logging two goals and an assist each night while factoring into Charlotte’s strong special teams showing. Thanks for the updates gocanes. So much potential in Charlotte. Who breaks out and replaces the Zykov, Foegele, and Wallmark points? And of course, can Ned get that save % north of .910? Despite the .880 in this last one, he's .918 so far. Also Jake Bean's first pro year. He needs to solidify his game like Fleury did. If I lived in Charlotte I'd be at almost all of these games. Went to one last year and it was a blast. So many good prospects. Bean- will be in Charlotte for 2 seasons for positioning and defense help. When does Booth get a chance and how much this season? I dont think we’ll be short on scoring with Geekie, Smallman, and Pu. I agree. They will be missing their #1, #2, and #5 point scores and 155 collective points though. Wallmark, Zykov, and Foegele all stepped up and forced their way onto the Canes. This year I'm looking to see who will do it. Someone will have to in order to replace their scoring, but I agree that some guys will. Roy seems to have the early jump on that, and man would that be great since he's a center. Personally I want to see Gauthier get things figured out. This guy was an elite goal scorer in Juniors. Geekie I agree with. Smallman is moving up, but not as sure. I love the guy, but does he have that much scoring in him? Pu is another potential Roy-type I think. Then I'd add in two Finns. I think Kuokkanen is eventually and NHL player, and possibly Maenalanen. OK, three Finns. I think Saarela needs to take a big step up this year, or he could begin to get lost in the gaggle of prospects. Maybe the Canes can call up whoever is running the special teams in Charlotte? Ned now with .933 save percentage over 4 games. Still early, but very ? so far! This is a cool thing Charlotte is doing. 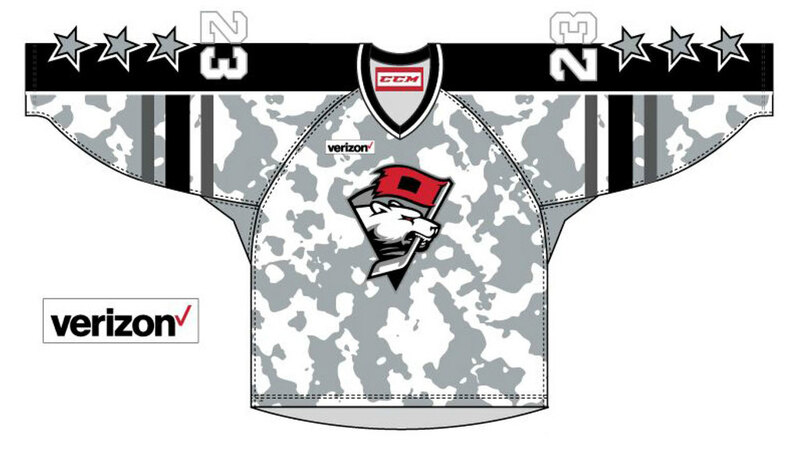 Wearing these as warmups for 6 games then auctioning them off for military charities. Im glad the Army went away from the ACU pattern but it goes better with Charlotte’s colors. I’ll throw a bid or two out there when these go on auction in April (if I remember). 15 minutes into the 1st, its 1-1. Ned has faced 2 shots. .500 sv percentage so far. 3-3 in the 3rd. Going to OT. Roy, Gauthier, and Kuokkanen scored. Ned has stopped 9 of 12. Bishop must be fantastic on the PK. All the goals for Hershey came on the PP. 3 for 7. Necas scored in the shootout to get the win. Bean got his first AHL point. Ned stopped 10 of 13, all on the PP. Charlotte’s PP was 1 for 8. Checkers suffer their first loss as they were shut out by Hershey 2-0. Ned stopped 22 of 24. Can Booth get some time? "Sake hasn't played well. He's had way too many turnovers and his effort hasn't been there. If you're not going to backcheck and play hard and do the things we ask you to do every night, then you're not going to be in the lineup. Hopefully he learns from it and understands that over here you've got to compete on every single shift and hustle. You will make mistakes - I can live with mistakes - but I cant live with not working hard." Maybe after Darling gets his. ?